What general categories do you follow on Pinterest? The Accidental Locavore naturally follows a lot of food categories. Recently I’ve noticed a distressing trend, so much of what people are pinning is beige…golden brown if you insist, but actually beige. This is especially perplexing at a time of year when there are so many beautiful, colorful, fresh fruits and vegetables! 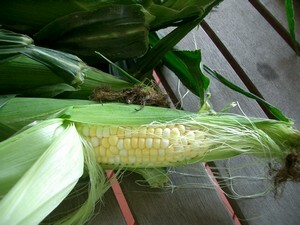 When I posted a photo of corn (in the husk), it really stood out. When I was checking out some of the boards where my stuff has been re-pinned, same thing, the first twenty-six pins were of beige or brown food, the twenty-seventh was a photo of (green) Brussels sprouts with bacon and avocado (an interesting idea to try in the fall, right?). Now, you can look at this in a number of different ways. The cynical, social media marketers can see it as an opportunity to stand out by posting brightly colored food shots. The food police can get on their soapboxes and shake their fingers, rallying against fried food, processed food, carbohydrates…whatever the evil food-of-the week is. The mompreneurs can continue posting beige food photos, it’s what’s popular–for dinner. If you’ve looked at my boards on Pinterest (to follow, just click here), you will have noticed one food board that is definitely beige, but even that celebrates an almost infinite variety of beiges, tans and creams. That board? Cheese! My most re-pinned? Yes, it’s brown and yes it’s sweet…a molten chocolate cake. What’s fascinating is that in one day, it just gained traction and was re-pinned all over the place. What’s disconcerting is that it’s pinned on boards next to all kinds of processed foods. Or (and do you think this is worse?) they’re on boards that give you recipes to make homemade versions of processed foods, using more processed foods. If you want to know why there’s an obesity problem in this country, just click on food & drink and see how many cute cupcakes or “Meatballs Wrapped In Garlic Bread Topped With Cheese And Dipped In Spaghetti Sauce” there are. Meanwhile, I’m going to keep posting and searching out a variety of things. 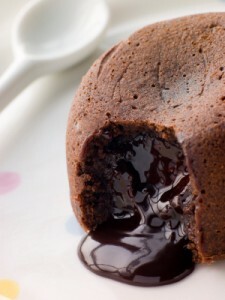 While my inner geek may make sure that most of what goes up is bright, colorful and delicious, the ruthless marketer might be looking for the next molten chocolate cake! What do you pin? Biege is reknowned, the world over, for representing the status quo, the ho-hum and the dreary of life’s “safe” choices. People who insist upon sticking to beige food ( or biege anything-else) are probably victims of a beige mind, i.e., no real imagination or sense of adventure. Pity them all! They will die with distressed palates! This is the crowd that always orders the same item on the same menu, believe boiled cabbage is a food group, drinks only non-descript “white” wine and think that escargot are “icky”. Poor devils.